Karen Stintz needs to go home. She lack the vision for 21st century public transportation. The GTA needs a grid of subways that will allow millions of people to travel without any issues. Take a look at NY, Hong Kong, Taipei, Berlin and London. Karen Stintz needs to go home! Of course we want subways but without the $, at least her plan gets us moving while the co-mayors live in dreamland. 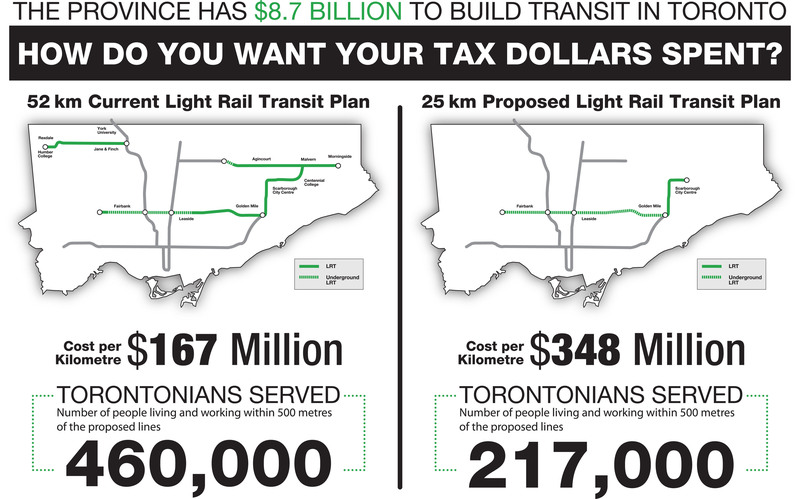 Speaking as a fiscal conservative and Ford supporter, the only solution to Toronto’s transit woes is to build expensive subways paid for almost entirely by the taxpayer. That way we can blame that boondoggle – which The People oh-so-desperately want – for any fiscal problems our administration may have. Want money for socialist libraries or socialist environmental initiatives, or socialist housing for low income workers? Sorry, we’re spending it on the TTC, just like You People demanded! Rob Ford is a political genius. Everything costs money but public transportation is a commodity not a luxury. The problem is getting worse by the day and thinking that LRT will solve the problem is a mistake. Toronto is an ideal city for great infrastructure, it is flat and spread. San Francisco uses streetcars because they have to and they have wider streets. Toronto’s traffic is a nightmare and adding more trains on the surface will block roads and take more real-estate from the already crowded streets is a bad idea. There are many ways to get this project funded for years to come, unfortunately, there vision and the audacity to do so are lacking at city hall. So what are the apparently many ways that this project (ie. a subway) can be funded? Please enlighten us, and maybe Mr. Ford as well – so far he doesn’t seem to have had any luck getting the private sector to open their wallets for his transit fantasy. I generally never agree with anything Mammolitti says, but Finch is truly underserviced by the TTC. The buses on Finch St. are constantly busy, day or night, and service some of the neighbourhoods in the city where people are more likely to use transit. Many on this line, like York students, new Canadians, seniors and the marginalized, do not have cars or other means or transport to and from destinations. I have often spoken with a senior manager at TTC and they too recognize the need for a transit plan with Finch at the forefront of any expansion. Sadly, the political will to start such improvements is lacking and many of the transit users on the Finch line are too busy trying to survive and feed families rather than lobby on behalf of their communities to improve service on this road. It doesn’t have to be a subway on Finch, but some improvement here is required. Use Google. Enlightenment is a click away. Ran’s right. If you need millions of dollars you don’t need to raise taxes, or bring back the vehicle registration tax, or consider tolls for all those out-of-towners driving vroom vroom down Toronto roads … you just need Google.